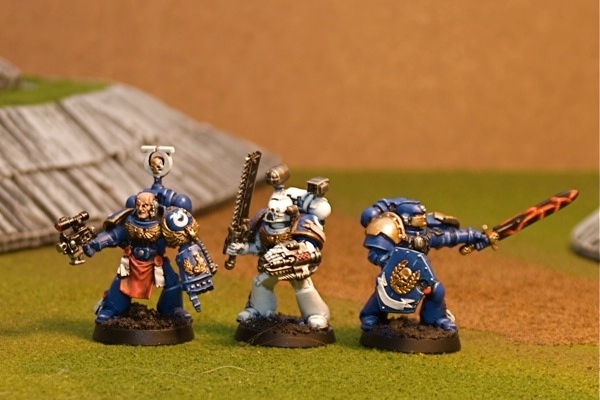 My last entry in this blog showed my tactical marines squads I - IV. Squad V & VI are assembled from the AoBR box set and awaiting to be primed. For now, I am working on my command squad and rhino/razorback. Still no word on my first game with these guys. The past weekend, my wife and kids were sick- leaving me home to care for whichever one was well for that day. Oh well, at least I got a few hours to play Dawn of War 2! I have had this captain for several years (and two editions). 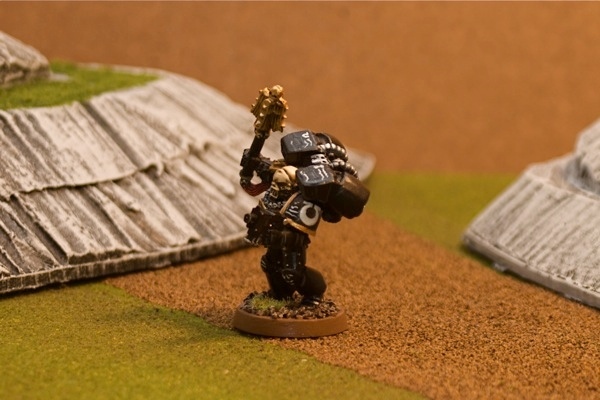 Back in the day, we was the cheap captain with plasma pistol and power weapon. Now, I don't know how much play he will get. However, he is finished and perhaps will get a retirement plan from the Company one day. 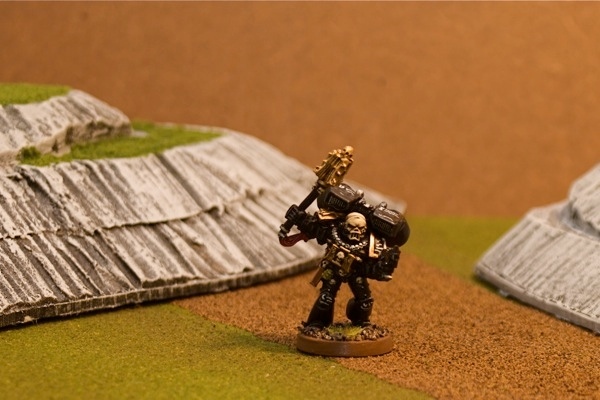 My jump pack armed chaplain. Nothing special. Of course he is nearly permanently attached to my assault squad with remarkable results. I have another chaplain on foot that is ready for primer. However, it might be awhile before gets any paint on him. Here is my command squad. 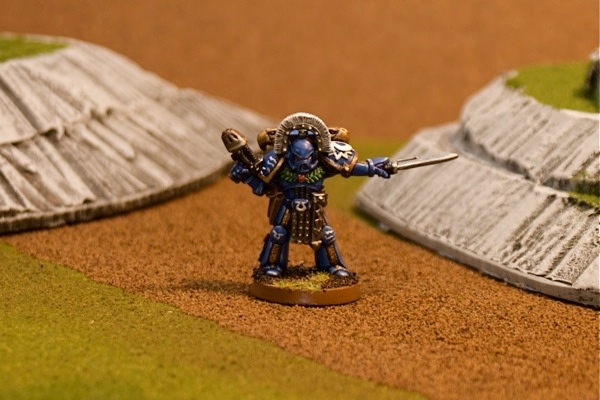 It was originally a 10-man squad under the old codex and has been trimmed down. 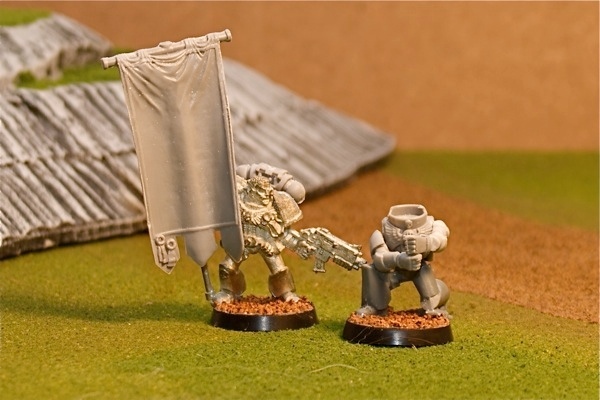 I also ditched my old standard bearer for this metal one that I never knew I had! Finally the last member is a new build- I am going for a kneeling on the ground with a power weapon bowed low kinda look. We will see. I still need to get the green stuff out and perhaps even pin a couple of places. It will probably be a little bit before I get him done. Right now the command squad transport is getting attention- its a rhino now, but I have some RB bits on order. Since the command squad was going to be 10-men all of the time, a RB was never in the works. But a new codex, brings new challenges! I don't have the link right now, but I added extra armor and Inquisitorial Rhino bits to it (double eagle). I'll get some pictures up soon.